I came back from Bali earlier this month. And as expected, it was a paradise and more. Actually Bali had been off of our holiday destinations list for a while. It was because of an unfortunate incident my husband had, which led to him getting stranded at the airport (old one, not the shiny new one they have now) and having to sleep in a room with a rat many years ago. Understandably he was quite traumatized by what happened and I almost gave up on going to Bali ever. So it was a real surprise that he suggested Bali for our late summer holiday destination. And I am so happy he’s recovered from that mortifying experience, because I love-love-loved Bali. I have to say I was slightly worried about the food. My knowledge and experience of authentic Indonesian let alone Balinese cuisine was very limited. Sure I had a couple of dishes that I liked before, but quite a few so-called Indonesian food I had in HK were not that great. And being on a holiday where I cannot enjoy the local food is just unthinkable. 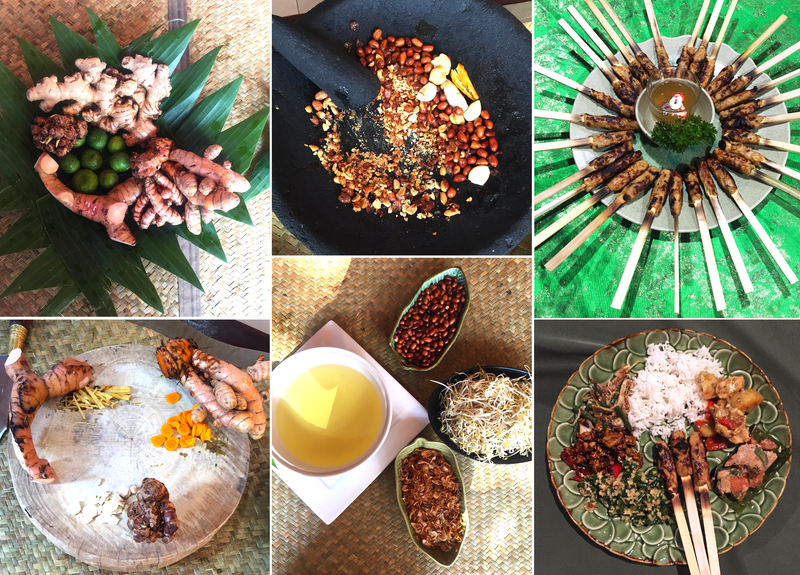 But as soon as I tried my first dish in Bali, I realized I had nothing to worry about. Food in Bali is amazing. Balinese food is down to earth, packed with flavors and aromas from the spices, and it has just right amount of heat from the chilies. 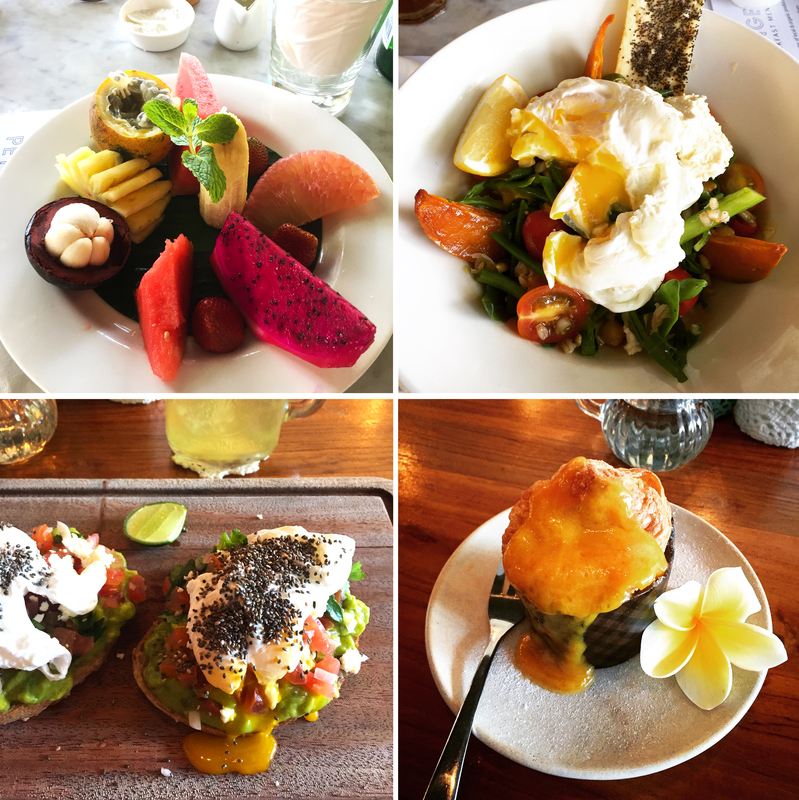 I was also impressed with so many great restaurants in both cities I visited (Seminyak and Ubud). 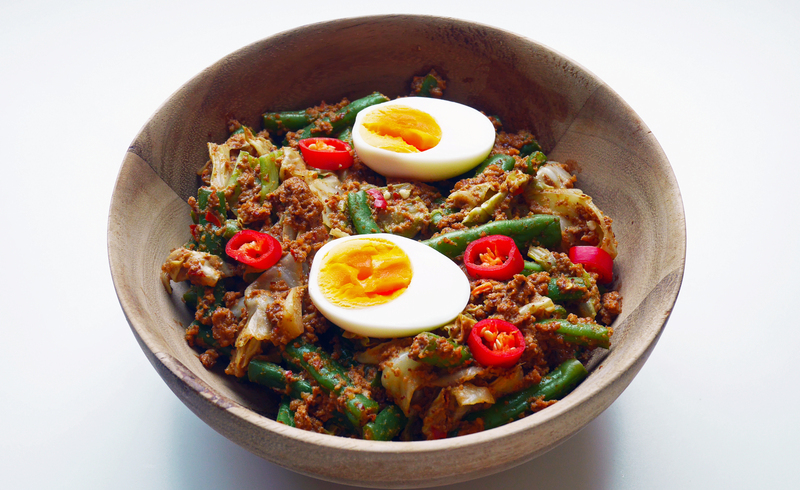 Whether you are looking for Indonesian, Western, Pan Asian or healthy food they have it pretty much all covered. Since majority of Balinese are not Muslim, I was also able to find some amazing pork (my favorite meat) dishes too. And of course if you are a vegetarian, you have endless options. 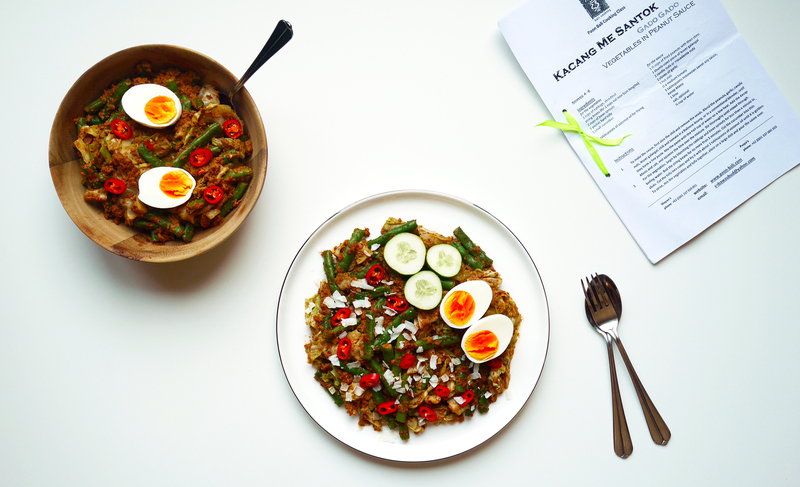 I am sharing a recipe that is inspired by our lovely cooking instructor Puspa’s ‘Gado Gado/ Kacang me Santok’ from Paon Bali cooking school. She and her husband are such warm and funny people, we had an incredible time cooking and eating with them. Although I couldn’t find some of the ingredients we used in a class, I was able to substitute and make my dish with things that I have at home. I also simplified the process a little bit and made it lighter by reducing fried elements. Blanch string beans in a boiling water for 3 minutes and set aside. Blanch white cabbage in a boiling water for 1 minute, or 30-40 seconds longer if you want it softer. Add 2 eggs in a boiling water and cook for 10-11 minutes. While vegetables are cooling and eggs are cooking, prepare the sauce. First, stir-fry peanuts in a tablespoon of coconut oil over medium-high heat for 3-4 minutes. They should have turned glossy and released nutty aroma. Next, add them into a food processor with the rest of the ingredients and blitz until you get smooth paste. You can add a little more water to make it even smoother, but try not to add too much at this stage, cooked vegetables will release quite a bit of water in the end. Place boiled eggs in a bowl of cold water to cool. Chop red chilis, slice cucumber and set aside. Mix string beans and cabbage with the sauce. Squeeze in lime juice. Taste and season with salt if necessary. 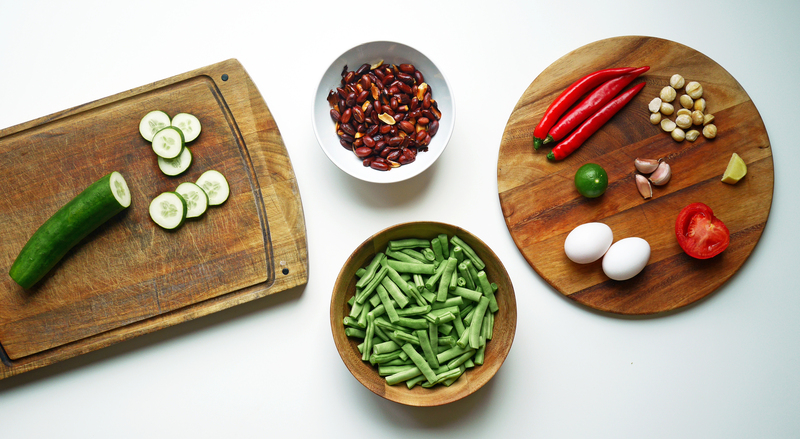 Peel the eggs and add on top with cucumber slices, and chilis. Garnish with coconut flakes. Enjoy! Amazing post and lovely photography as always, Jin. The cooking class sounds great! Feeling very inspired right now. 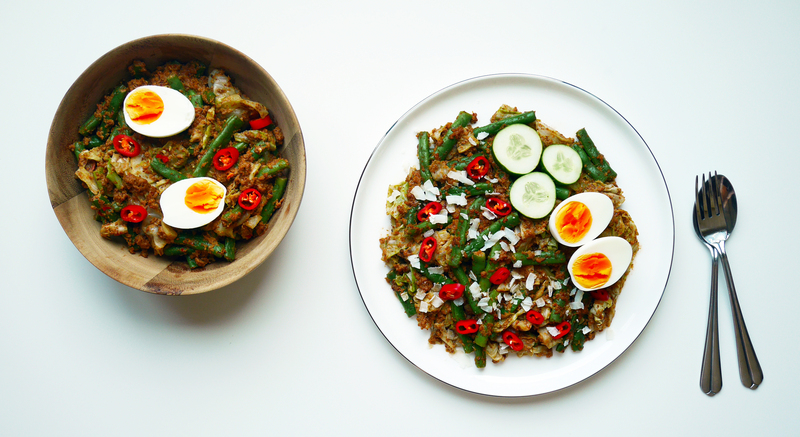 Great recipe Jin – I enjoyed gado gado on a trip to Bali earlier this year – so great to see how it’s made! What a small world – I, too, took a cooking class at Paon! Would love to try this recreation of their recipe. Looks delicious!